We all remember playing with tray puzzles when we were young. If so, then you would surely remember the sense of accomplishment and fulfillment when you solved a complex puzzle, revealed a beautiful picture in the end, and relished. Similarly, customers can be engaged much more effectively when they are involved in solving such puzzles. The picture to reveal will reflect your brand, and implant a stronger memory and footprints in the minds of the customers as to who you are. The promotional advertisements through television and magazines are obsolete in the current context. With so many brands in the market today, it is not possible to have an impact on your target audience through conventional modes of advertisements. As such, PuzzlesPrint gives you the opportunity to enhance your marketing efforts through its active tray puzzles customized precisely according to your needs. At PuzzlesPrint, we believe in personalised services, and therefore, we have a variety of tray puzzle designs to suit a diverse set of requirements. The puzzles contain the appropriate number and type of pieces that are reflective of your brand. The portions can be easily separated and also made with a glossy or matte finish. With the options of both one-sided and two-sided tray puzzles, you have ample space to incorporate your message with utmost clarity. Additionally, to ensure optimality, our tray puzzles are carefully packed in shrink wraps thereby easing you of the need to have an additional package. It makes our puzzles lighter and easier to distribute to your customers ensuring safety while being transported. So, get your tray puzzles now and boost your sales with minimal effort. 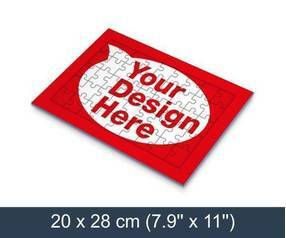 To start creating your tray jigsaw puzzle, select the jigsaw size and upload a photo, design or artwork!